Primary Results: Alexandria Ocasio-Cortez Defeats Leading House Democrat Rep. Joe Crowley, a contender to succeed Democratic Leader Nancy Pelosi, was upset by Alexandria Ocasio-Cortez, a 28-year-old activist. In GOP primaries, incumbents backed by President Trump won out. 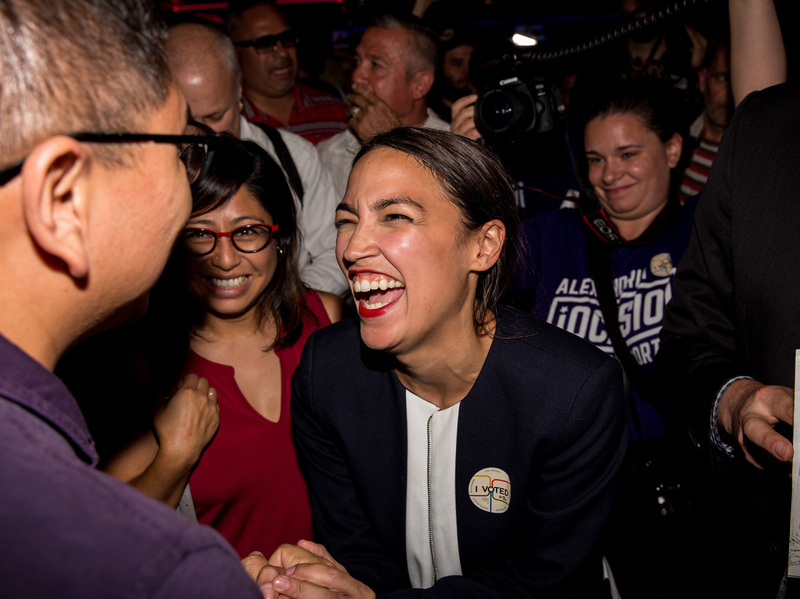 Progressive challenger Alexandria Ocasio-Cortez celebrates with supporters at a victory party in the Bronx after upsetting incumbent Democratic Rep. Joseph Crowley on Tuesday night. It was a breakthrough for the left wing of the Democratic Party, in a primary season where they haven't been able to cause too many headaches for the establishment. Crowley's defeat capped a string of progressive victories over the Democratic establishment on Tuesday, including in the Maryland governor's race, where Ben Jealous won the nomination with the backing of Sen. Bernie Sanders. Crowley's primary loss also shakes up the Democratic leadership hierarchy in Congress. He was long considered a possible contender to lead House Democrats or even become speaker if California Rep. Nancy Pelosi either steps aside or is pushed out after the midterms. Instead, he has now fallen, on his home turf, in a monumental loss reminiscent of then-House Majority Leader Eric Cantor's GOP primary loss in Virginia back in 2014. In GOP primaries, President Trump was able to lift two candidates to victory on Tuesday, with one of his earliest allies, South Carolina Gov. Henry McMaster, winning his GOP primary runoff and New York Rep. Dan Donovan also beating back a challenge from former Rep. Michael Grimm. The president has been burned by making endorsements in the past that didn't pan out (twice in Alabama's special Senate election last year), but he put two more wins in the bank after stumping Monday night for McMaster and tweeting his support for Donovan last month. Here's what happened in the New York, Maryland, Utah, Colorado and Oklahoma primaries, along with runoffs in South Carolina and Mississippi. Tuesday was a good night for progressives across the country, in several House and gubernatorial races. Ocasio-Cortez's unexpected victory over Crowley is the biggest upset yet by a progressive upstart challenger over the Democratic establishment. She handily defeated the incumbent, leading Crowley by 15 points in unofficial results. A former organizer for Vermont Sen. Bernie Sanders's presidential campaign, Ocasio-Cortez ran a vigorous race over Crowley in the increasingly diverse Bronx and Queens district, and she used her Puerto Rican heritage to identify with the district's rapidly growing Latino population. A Democratic socialist who previously worked for the late Massachusetts Sen. Ted Kennedy, she backs abolishing Immigration and Customs Enforcement (ICE) and supports Medicare for all and free public college. Ocasio-Cortez's victory comes in a year when Democratic women have been prevailing in many primary contests. Still, Crowley had been seen as untouchable — he was also chair of the Queens County Democratic Party and a major force in New York politics for decades, aside from his rising stature in the House Democratic leadership. But Ocasio-Cortez argued that was part of the problem, making the case that Crowley had grown too distant from his district, while highlighting her own working class roots. "It's time we acknowledge that not all Democrats are the same. That a Democrat who takes corporate money, profits off foreclosure, doesn't live here, doesn't send his kids to our schools, doesn't drink our water or breathe our air cannot possibly represent us," she swiped at Crowley in one ad. Trump reacted with glee to Crowley's toppling, though his claim that the incumbent's loss would have been mitigated had he been nicer to the president is belied by the fact that it's a district where Trump got less than 20 percent of the vote — plus Crowley was defeated by a challenger who ran to his left. Three other New York City Democratic members — Reps. Carolyn Maloney, Yvette Clarke and Eliot Engel — also faced primary challenges of note. All three ended up winning, though Clarke only prevailed by about four points. Progressives also prevailed in the Democratic gubernatorial primary in Maryland, which also highlighted the differing approaches battling for supremacy in that party. Jealous, a former NAACP president who was endorsed not only by Sanders but by New Jersey Sen. Cory Booker and other progressive figures, defeated Prince George's County Executive Rushern Baker, who had wrapped up the support of much of the state's political establishment, such as Sen. Chris Van Hollen and House Minority Whip Steny Hoyer. Both candidates are African-American, and now Jealous has a chance to become the first black governor in Maryland history if he wins — and only the third elected across all 50 states. But Jealous will have a difficult race against incumbent GOP Gov. Larry Hogan. Even though Maryland is traditionally a blue state, the centrist Hogan remains extremely popular — even among Democrats — and has been a frequent critic of Trump. Several competitive New York House seats are also a key part of Democrats' calculus to winning back the House, and in one important contest the more liberal candidate beat the establishment choice. In the 24th District, college professor Dana Balter, who was running as the more progressive pick with the backing of MoveOn.org and all four county committees, prevailed over the Democratic Congressional Campaign Committee's favored candidate, Juanita Perez Williams. Local officials had complained about DCCC meddling in the race, and now it's Balter who will challenge GOP Rep. John Katko this fall. In New York's 1st Congressional District, former commercial real estate lending executive Perry Gershon, who spent nearly $1 million of his own money in the contest, bested three other women candidates to claim the Democratic nomination, bucking national trends that have seen female hopefuls advance in other races. He'll face GOP Rep. Lee Zeldin in a Long Island district Trump carried by about 12 points. And in the 19th District, attorney Antonio Delgado won the Democratic nomination and will challenge Republican Rep. John Faso. Democrats hope to make this seat competitive as well; Trump won it by about seven points, but former President Obama carried it twice. In Colorado, Democrats have been angling for a long time to take out Republican Rep. Mike Coffman in his suburban Denver district , which Hillary Clinton carried by 9 points. The DCCC got their preferred pick there, with attorney Jason Crow easily beating energy consultant Levi Tillemann, who had been pressured by Hoyer, the House Democratic whip, to abandon his bid. South Carolina Gov. Henry McMaster was able to fend off Iraq War veteran John Warren in a runoff, after falling short of a majority in the five-way Republican primary two weeks ago. Warren had tried to argue he was the most Trump-like candidate as an outsider businessman, but it was McMaster who had Trump's vocal blessing, as he seeks a full term as governor after assuming the job after Nikki Haley became U.N. Ambassador. Both McMaster and Trump will surely point to the president's election eve rally for McMaster as instrumental to clenching victory. McMaster has been one of Trump's most loyal allies. When he was lieutenant governor, McMaster became the first statewide-elected official in the country to endorse Trump back in January 2016. On Monday, the president acknowledged his own record was on the line if McMaster didn't won. "They will say, 'Donald Trump suffered a major, major defeat in the great state of South Carolina. It was a humiliating defeat for Donald Trump.' So please get your asses out tomorrow and vote," Trump told a West Columbia crowd Monday night in a stemwinder of a speech that mentioned the incumbent governor only briefly, though he joined Trump onstage at the beginning. The president's other major endorsement that was tested Tuesday was in New York. Trump didn't campaign for Rep. Dan Donovan, but allies for the congressman said the president's tweet last month endorsing the incumbent over former Rep. Michael Grimm in the Staten Island-based 11th Congressional District helped majorly boost his chances in their bitter primary. Grimm tried to campaign as the more pro-Trump candidate, but in the end he didn't even come close to knocking off Donovan. The former congressman held the seat before he was forced to resign as he pleaded guilty to tax evasion charges and spent seven months in prison. In his tweet endorsing Donovan, Trump cited last year's Alabama Senate loss as a warning that Grimm would be unelectable in a general election. That's exactly what national Republicans had feared, but they're breathing easier now. Still, Democrats are enthused by their nominee, Army veteran Max Rose. Contests for open seats in safe Republican regions of South Carolina and Oklahoma will impact the direction of the House GOP conference. In South Carolina's 4th District runoff, state Sen. William Timmons, who had more establishment support, defeated bombastic former state Sen. Lee Bright, who had the backing of the Club for Growth as well as Iowa Rep. Steve King. In this conservative district, Timmons will be the heavy favorite to succeed retiring GOP Rep. Trey Gowdy. In Oklahoma's open 1st District, where Jim Bridenstine stepped down after he was confirmed as NASA administrator, former Tulsa County District Attorney Tim Harris will advance to an Aug. 28 runoff. Businessman Kevin Hern, who is backed by the centrist Republican Main Street Partnership, is still battling for the second runoff spot with Iraq War veteran Andy Coleman, who was endorsed by the conservative House Freedom Caucus and Club For Growth. In Colorado, Rep. Doug Lamborn defeated several primary challengers after nearly failing to make the ballot. Initially he had been thrown off after district voters filed a lawsuit arguing his petition signatures were invalid because the people he hired to gather them were not Colorado residents, as required by state law. But he was put back on the ballot by a federal judge. Former 2012 GOP presidential nominee Mitt Romney easily won the GOP nomination for Senate over state Rep. Mike Kennedy in the race to succeed retiring Sen. Orrin Hatch. The former Massachusetts governor had been a vocal Trump critic, even excoriating him as a "phony" and a "fraud" during the 2016 campaign. And while Romney is definitely not a glowing fan of the president, he has muted his criticism somewhat and Trump has even endorsed him, reaffirming his support Tuesday night. "I look forward to working together," the president wrote. While not backing Trump enough has been costly in other GOP races, nearly one-fourth of voters in the conservative state of Utah voted for a third-party candidate in 2016 instead of Trump, who took only 45 percent of the vote. Romney remains very popular in this heavily Mormon state, where he helped save the 2002 Winter Olympics. Democratic Rep. Jared Polis won his party's nomination to succeed term-limited Democratic Gov. John Hickenlooper in Colorado, which could make history. If Polis wins in November, he would be the first openly gay man ever elected governor in the country. EMILY's List backed former state Treasurer Cary Kennedy. While Democratic women have sailed in House races this year, they've had more trouble in gubernatorial contests. On the GOP side, state Treasurer Walker Stapleton won the nomination, after being attacked by his chief rival, former state Rep. Victor Mitchell, because he is a Bush family cousin, saying that means Stapleton hasn't been loyal enough to Trump. Stapleton wasn't the only political scion in the race — investment banker Doug Robinson is a nephew of Romney's. A previous version of this story incorrectly said that Alexandria Ocasio-Cortez supports Medicaid for all. In fact, she supports Medicare for all.